I love being creative, mostly in wood and metal but in other medium too. Green woodworking is my main approach. With over 20 years of green woodworking experience I am happy to share my experience, skills and knowledge. A quick explanation about what omubazi means, in one, or more African tribal languages it basically translates to "the man that takes a tree and splits it and makes things from it". I love the very idea of that, and am more than happy to be connected to that very definition. My earliest memories of being creative are way back in time to when I was able to reach tools on my dad's bench in the shed. Naturally they were mightily crude creations, but were the starting point. As I grew in size so did my asperations. I recall taking dad's felling axe and two man saw over the garden fence into the woodland and felling trees. My friends and I built forts, made dams across the stream and all manner of other things. My earliest pride and joy was making a tree house that only I seemed to be able to reach. Maybe the barbed wire that I wrapped around the tree put most enquiring minds off. In the end my younger brother did try, but got his foot stuck between the two intertwining trunks. My dad came to the rescue, using the same axe and saw and felled the tree destroying my construction in the process. Such is life, though I had long since stopped using it. Many years later I qualified as a CDT teacher at Shoreditch Teacher Training College, Englefield Green, Surrey. That was where I was able to widen my creating skills to cover a mind blowing range of crafts, skills, materials and processes. The school teaching days are long over, but learning new crafts, skills, processes and handling new materials continue to this day. Long may it continue. I have no idea how many people I have taught to work with green wood, to forge metal and to a lesser extent work with leather. 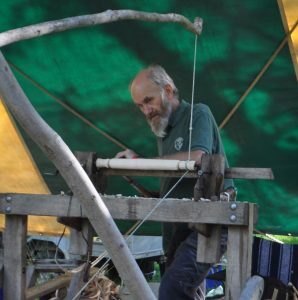 Much of the green woodworking involves pole-lathe turning. This comes mainly in two forms, spindle turning (my main activity) but also bowl turning where I have limited experience. Pole-lathe turning usually involves turning green wood, i.e. unseasoned wood straight from the tree. After cutting to length the wood is split along its length and subsequently reduced in size until it is right for its intended purpose. This split, or cleaved, billet is then refined in shape sometimes with an axe followed by a drawknife. When the billet is sufficiently rounded it is centred on the lathe ready for roughing cuts to be made. From there shaping and smoothing is undertaken with a range of skew chisels and a finishing chisel. A handful of dried shavings can be used to burnish the surface if required. Rarely is abrasive paper used. But, it's not all about pole-lathe turning. There are many ways to create with green wood. Spoon carving is one such option. Items can be made just by shaping and smoothing using a shaving horse and drawknife. Carving has so many possibilities. One of my latest newly acquired crafts was making a fan bird, a combination of carving and splitting wood. I've a long way to go before being proficient, but intend to spend time working on this. I mentioned blacksmithing, and this is an ideal way to make your own tools that are purpose made for specific tasks. A double hit as you have fun making and then have fun making with what you have made. I mentioned earlier that I have lost count of the number of people that I have taught pole-lathe turning too, and also helping a huge number with enhancing their skills. There is a real pleasure in helping in this way. In early 2017 I spent six weeks in Uganda helping some young people to learn pole-lathe turning. Whilst there we made two pole-lathes and two shaving horses as well as refurbishing two other lathes that had been made the year earlier. The inspiration to get involved in Uganda came from Roy Godber, an expat Brit living in Canada. Roy had worked in Uganda and Kenya and thought that with irregular electricity supplies, very high unemployment, extremely rare funding for adult training and the very real need to be self sufficient that pole-lathe turning would be useful approach to introduce. I think he is right and that this should be extended to other green woodworking crafts. In January 2019 I return to Uganda to mentor one of the young ladies, Lillian, that I taught in 2017. The aim will be to enhance her turning skills and to guide her through tutoring techniques that she can use to pass on these crafts to other folk. In addition, I'll also teach her as many of the other crafts that I know as resources allow in my time with her. It has also occurred to me that a blog such as this could have "how to" guidance notes, photographs and videos perhaps to offer distance learning. Hopefully this is something that I can include. With this particular trip I have received some funding to help with the costs from the 'Association of Pole-lathe Turners & Green Woodworkers' . The fabulous charity 'Tools for Self Reliance' provided some tools for me to take and I have also been given sums of money from anonymous donors keen to help. For all of this generous help I am most grateful. Watch this space for updates. For now I'll leave you with this thought; as we go through life we all meet people that inspire us. I believe that I owe it to those that have inspired me to attempt to inspire others to keep inspiration ongoing for the general good.